11.15 a.m.: Morning Prayer, Holy Trinity Church, Rathkeale, Co Limerick. Isaiah 50: 4-9a; Psalm 118: 1-2, 19-29; Philippians 2: 5-11; Matthew 21: 1-11. 231: My song is love unknown. May I speak to you in the name + of the Father, and of the Son, and of the Holy Spirit, Amen. I suppose that, like me, many of you wake up each morning to talk radio, and to the early morning warnings about traffic hold-ups and traffic delays. As a new arrival here, worried about lifts into Limerick and bus connections last week, I noticed those warnings about traffic in Limerick this past week, and the delays at Clarina and Mungret. Like most of us, I am sure, I found myself wondering were these delays going to get in my way, going to delay me, was I going to get stuck, to be late. We live in a time when time is precious, when time is money. ● A mother trying to get her children to school and late for the job she is desperately clinging onto. Maybe her car has had a brush with someone else’s, she has to wait for the gardai; now she is worried about her children, her job, and someone is behind, hooting. ● The bus driver who has a full load of passengers, each one complaining in a nasty way because the bus was late and now has broken down. But who thanks him when he is on time when he is not on strike, or when he squeezes in a few more people, even if it means breaking the rules? ● A young business man, trying to clinch that export contract. That traffic warning leaves him fretful, worried that he is not going to get from here to the airport on time. He is going to miss his flight and lose that contract. ● An elderly man with a heart complaint, stuck on his way to hospital. He is worried he is going to miss his appointment, and worried his worries are now compounding his heart problems. But, by now, I am stuck behind one or more of them. I am wondering why they are not moving. Did the lights not change to green 10 minutes ago? Do they not know I am late? We have all been there, stuck in that traffic, stuck in that car. We all know how selfish we can become, how self-centred, how self-focussed we can be. My priorities come Number 1, and everyone else should know that. If Christ was to travel into Limerick city early one morning this week, I could imagine he would create the same problems. Just imagine it. Telling two of the disciples to go up the road, say to Askeaton or Newcastle West, where they can find a fairly new car, a 2015 car say, waiting for them. The owner is delighted to hand it over. He has the highest regard for Jesus, they went to school together, worked on great projects together. He even thinks this Jesus is special. And so the disciples happily fit out the car, and off they head with Jesus into Limerick. As they arrive at the Dock Roads Roundabouts, the crowds are gathering. This is a big show. They follow him in a convoy, whooping and hooping. By the time they arrive into the Crescent or O’Connell Street, AA Roadwatch is warning people about the bottle necks in the city centre. ● Did anything good ever come from west Limerick? ● Why can they not just move on, and let us get on with the busy demands of daily life? ● Can they not see I am trying to get to see my mother in a nursing home? ● Do they not know a big match is on in Thomond Park today? ● Sunday should be a day of rest – why do they bring religion into everything? Others want to give Jesus the red-carpet treatment, today’s equivalent of cutting down branches and spreading them out before him. 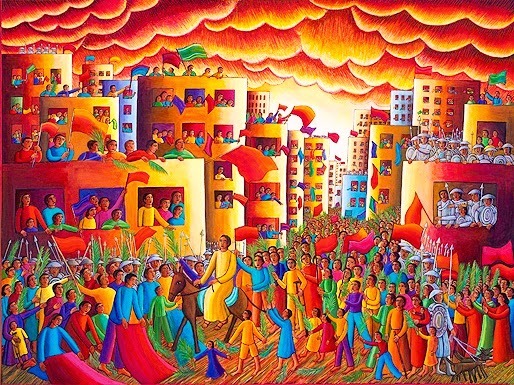 That chaos, that turmoil in Jerusalem, in the days immediately before Christ’s death echoes the chaos in the city in the days immediately after Christ’s birth. The last time there was such a fuss in Jerusalem in the life of Jesus was just after Christmas. Saint Matthew tells us that Herod became seethingly jealous and outraged at what the Wise Men said when they called to visit him. He tells us: ‘When King Herod heard this, he was frightened, and all Jerusalem with him’ (Matthew 2: 3). There is a link between the birth of Christ and the death of Christ, between the arrival of the three kings in Jerusalem after Christmas and the arrival of Christ as king in Jerusalem before Easter. We have entered the last week with Christ in the days before his Crucifixion. 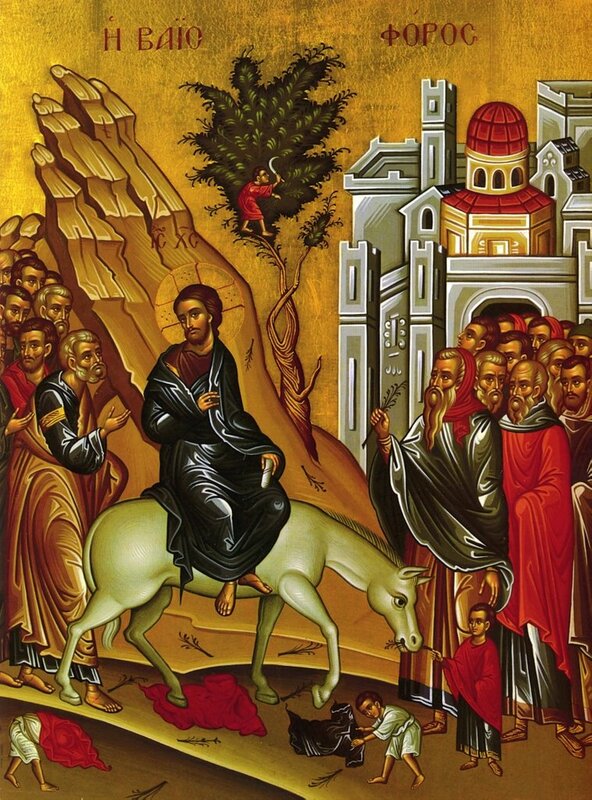 In Saint Matthew’s account, Jesus arrives in Jerusalem on Palm Sunday to great solemnity. Saint Matthew’s description of Christ’s triumphal entry into Jerusalem sounds the note of majesty and kingship before the Passion narrative begins. But the Gospel writer gives us hints too that we should be also looking forward to Christ’s second coming. Palm Sunday begins on the Mount of Olives but it points to Mount Calvary. Yet it also points to the second coming of Christ (see Matthew 24: 3), for the Messiah was expected to arrive on the Mount of Olives, and to sweep down through the Kidron Valley and up into the city, taking with him in his royal procession the living and those who were raised from the dead. 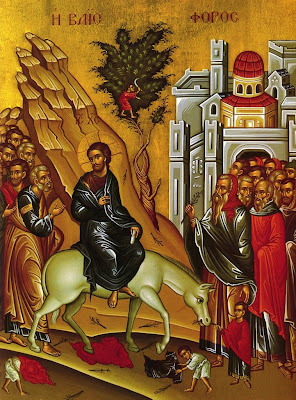 Christ’s entry into Jerusalem on Palm Sunday is the entry of the king into his capital. And the crowd acclaims him as king when they say: ‘Blessed is the one who comes in the name of the Lord!’ This phrase from the Psalms was used as a title for the Messianic king (Psalm 118: 26). Many in the crowd expected a new liberating king. But did anybody on that first Palm Sunday really realise who Jesus truly is? Their expectations of him are high, but deep down their attitude towards Christ is unchanged. For most of them, he may still be a prophet in their eyes. But that is less than he actually is. He may be a king, but they want a king who will deliver what they want, not what he has come to give them. The crowd that welcomes him in is soon to turn him out. He is an outsider coming in, and if he disappoints them, if he fails to give them what they want, rather than what they need, then it is inevitable that they are going to turn on him. When he fails to meet their expectations, he loses his popularity. When he refuses to accept the expectations they lay on his shoulders, they force him to carry the cross on his shoulders. When their hopes die, he must die. ● Jesus upsets our priorities. ● Jesus makes demands on our time. ● Jesus makes demands on our commitments. ● Jesus challenges us about where we are going. ● And yet, Jesus offers no quick fixes. Jesus steps into the comfort zones of the people in the city, and offers no quick fixes for the masses. They change their attitude, and there is a rapid, radical change in the social climate in Jerusalem that first Holy Week. Things get out of hand, and Jesus has no control over what happens. God in Christ has emptied himself of all choice and control. So often we want to be in control, we want to have the choices. And yet life is not like that. When we find we cannot control the agenda, we get upset, we get frustrated. It happens every morning in traffic. When we can control the agenda, when we have the choices, so often we act in our own interests, rather than in the interests of others. But, you know, we are never fully human when we are alone. We are never fully human without relationships. The communities on the west coast of Ireland showed true humanity, showed true capacity to love, lived out Christ-like priorities, as they gave and shared unselfishly, abandoned individual priorities in recent weeks in the search for the missing coast guard crew from rescue helicopter 116. The images that came to the fore from those communities throughout that search has reminded me constantly of the Good Shepherd and his search for the lost sheep. I am least like Christ when I put my own selfish interests, my own gain, my own immediate demands, before the needs of others. When we value relationships, when we consider the needs of others, when we show that community matters and show that relationships lead to love, we become more like Christ. Palm Sunday teaches us about getting our priorities right. Good Friday shows us how God gets those priorities right. Good Friday appears to be the end. But it is only the beginning. … In my end is the beginning. Palm Sunday seemed like a triumphal beginning. Good Friday seemed like a frightening end. But in the end we find the beginning, our hope is in our Easter faith. Easter gives us the hope that when we get our priorities right, when I turn from me to us, from self to relationship, then I not only become more human, but I become more Christ-like. And, when we become more Christ-like, we become more like the person God created us to be. And so, may all we think, say, and do, be to the praise, honour and glory of God, + Father, Son and Holy Spirit, Amen. (Revd Canon Professor) Patrick Comerford is Priest-in-Charge of the Rathkeale and Kilnaughtin group of Parishes, Diocese of Limerick and Killaloe. This sermon was prepared for Holy Trinity Church, Rathkeale, Co Limerick, on Palm Sunday, 9 April 2017. 9.45 a.m.: The Eucharist, Castletown Church, Kilcornan, Pallaskenry, Co Limerick. Readings: Isaiah 50: 4-9a; Psalm 118: 1-2, 19-29; Philippians 2: 5-11; Matthew 21: 1-11. (Revd Canon Professor) Patrick Comerford is Priest-in-Charge of the Rathkeale and Kilnaughtin group of Parishes, Diocese of Limerick and Killaloe. This sermon was prepared for Castletown Church, Pallaskenry, Co Limerick, on Palm Sunday, 9 April 2017. 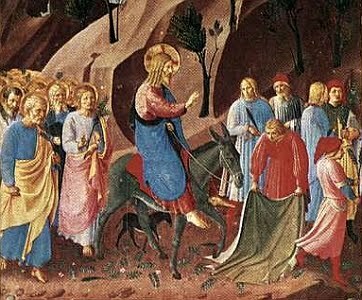 Today is Palm Sunday [9 April 2017] and in our pilgrimage and journey in Lent we have arrived at Holy Week, the last week in Lent, with Easter Day a week away [16 April 2017]. This morning I am presiding at the Palm Sunday Eucharist at 9.45 a.m. in Castletown Church, Kilcornan, Co Limerick, leading Morning Prayer at 11.15 a.m. in Holy Trinity Church, Rathkeale, Co Limerick, and preaching in both churches. This week, from today, Palm Sunday (9 April) until Holy Saturday (15 April), the USPG Lent Prayer Diary is following the narrative of Holy Week. The topic is introduced today in an article in the Prayer Diary by Paulo Ueti, a bible scholar and theologian in the Anglican Church of Brazil. It is our calling as Christians to configure our lives to be like Jesus, which is not an easy task! It requires a deep desire to be changed and to assume the work of changing the world. A crucial theological concept – and a key life experience for believers – is that God always takes the initiative and comes to meet us, no questions asked, no special behaviour required, no conditions set. Our part, as disciples, is to open ourselves up to receive and accept God’s transforming love. Out of such an experience of God’s love we are then able to love others and welcome in a manner that is non-judgemental. Discipleship is also about empowering communities to strive for transformation by struggling against inequality, violence, poverty, fear and individualism. This is our Easter pilgrimage! We are also called to encounter the Cross – which means not running away from the conflicts of everyday life, which are our teachers. So often it is during our darkest nights – when we are in crisis and feel lost – that we experience the dawn of resurrection. The fourth-century Church Father Evagrius Ponticus says we can only encounter God if we are prepared to encounter ourselves in truth. When we can acknowledge and accept our own darkness, then we are able to accept others. work to transform our communities, in your Son..